You are here: Home / Cookies / Brownies / Fancy Brownies / Praline Brookies! In keeping with the goofy-named cookie theme, I baked a batch of “brookies” – a combination of brownies and cookies. 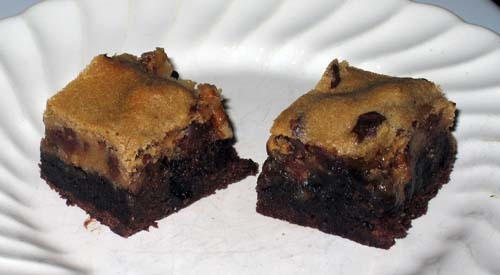 There are a lot of half brownie/half cookie recipes out there, but I think the name “brookies” was coined by the person who created this particular version for the Pillsbury Bake-off. These are very easy to make because they use brownie mix and refrigerated cookie dough. The catch is, they have a rich, buttery, homemade praline center that keeps the brownie base very moist and adds a nice shot of rich flavor. I loved these and plan on trying a few variations. I followed the directions with a few minor changes. Instead of cutting up a roll of cookie dough, I used the pre-cut cookie dough circles. I also lined my pan with foil for easy lifting and cutting. And for cutting, I cut mine very small. These are super rich! And finally, they taste much better chilled. OMG!! These look soooo good! I have to try them TODAY! I make something similar, but it has a shortbread cookie crust with a brownie top. Again, in keeping with your silly names, I call them “Brownie Bread”. Val, I just set the cookie dough pieces next to each other and they all just spread together perfectly.I might try making it with brownie mix and homemade cookie dough. The brownie mix tasted great, but the dough part definitely tasted like packaged dough. This wasn’t a problem, because the sum of the recipes parts make them delicious AND I happen to like packaged cookie dough sometimes, but I’d love to try these with a standard batch of cookie dough made with the Tollhouse recipe. yum. I’ll definitely try those someday thanks for the review. did the cookie dough circles just spread out on their own. was there any “coverage trouble”?